use of high-quality, 100% pure and always certified botanical terpene isolates and profile blends. expert and trusted producer of precision and custom terpene blends, particularly for quality-driven developers of cannabis products at all production scales. standardizing the aromas, flavors and effects of our customer’s lifestyle products. successful products with a benchmark for quality and compliance for years to come. We love the community that this board has brought together; a community that shares the same drive as we do for education and support. We wanted to officially say hello with our new profile on Future 4200. We wanted to reach out to the community to hear a little bit more about your experiences with terpenes. Any desires, challenges, success stories? I’m curious, have you seen this yet? Thanks Scooby for this share. We will look further into that, its definitely not mineral oil, YUCK! It’s hard to test for something in analytical equipment when they don’t know the parameters for testing the sample since the sample is “unknown”. The “mineral oil” might be contamination from the container or syringe the sample was in, or some mystery peaks that pointed to a compound that they deemed “like” mineral oil. We will definitely look into those reports and see what peaks it was throwing. I say this often, there are many, many different types of terpenes. We assure you this product is terpenes, its just not a run of the mill terp blend you would find on a normal test. Again we appreciate the share and will be looking at those reports closely. I look forward to doing a walk through of your manufacturing facility here soon so we can show everyone what quality looks like behind the scenes! Looking forward to response. I just read at ic and it’s scary if there is mineral oil in viscosity. True Terpenes VISCOSITY extract liquifier LAB TESTS: Mineral oil but no terps!! Fellow concentrators: If you use True Terpenes beware! 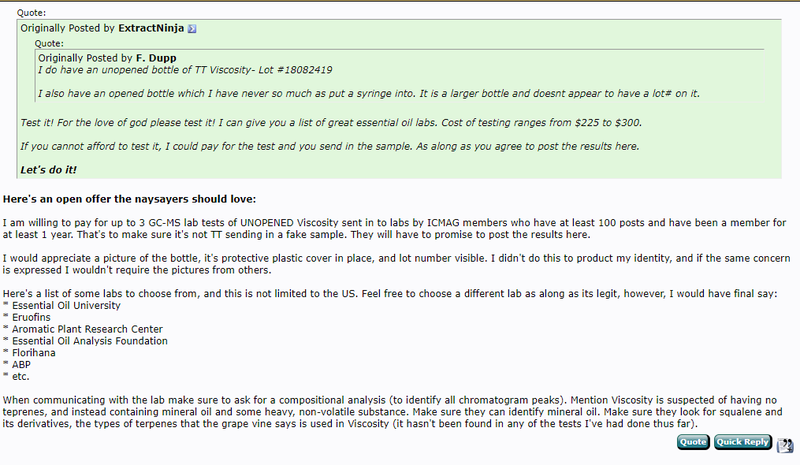 I choose to have Viscosity tested at two labs because I really disliked the product. It left a burning/irritating sensation in my throat and a bad taste in my mouth. I had enough Viscosity left to justify testing it to see if I wanted to keep using it (I don’t!). They claim that their dilutant is made from 100% terpenes, but it’s NOT. According to lab results it’s really “a blend of some very heavy, non-volatile, odorless material, along with some mineral oil”. The lab ruled out squalene as an ingredient. Sadly, it’s apparent that True Terpenes is lying and ripping people off. The very people who are specifically looking for a terpene based dilutant. And on top of that, True Terpenes is charging an INSANE amount of money for what is very inexpensive mineral oil and some unknown non-terpene material. So, if you don’t want to vape mineral oil and some unknown, non-terpene material (possibly derived from petroleum oil), STAY AWAY from True Terpenes. I decided to pay for two separate GC/MS analyses of True Terpenes Viscostiy extract liquifier (at two different labs) to make sure there really is mineral oil as an ingredient. I didn’t believe the first lab because I didn’t think True Terpenes would actually include mineral oil into a vape product used for medicine. However, after the second lab had the same results as the first lab there is no denying the sad fact True Terpenes is lying. Lab test #1: I’m waiting on the final report from the first lab test of Viscosity. The lab found mineral oil and some very heavy, non-volatile, odorless material they suspect may be some type of petroleum derived synthetic isoparaffin solvents. Once I receive the final report I’ll share it here. Lab test #2: Below are the results from the second lab test of Viscosity. This was carried out at Essential Oil University by Dr. Robert Pappas, Ph.D. in Physical Chemistry. It’s one of the best, if not the best labs for analyzing terpenes in the entire world. Dr. Pappas reported that squalene was not found in the sample. 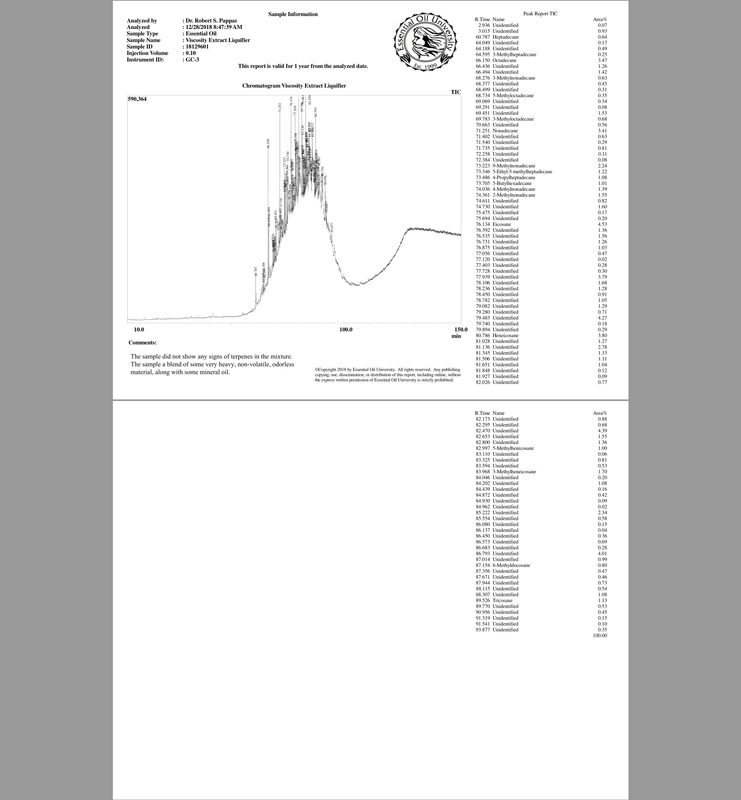 If I can figure out how to upload a PDF I’ll share the actual report. The sample did not show any signs of terpenes in the mixture. The sample is a blend of some very heavy, non-volatile, odorless material, along with some mineral oil. Hello everyone. We got to the bottom of this. True Terpenes has built our brand on consistency, quality, and trust. It is simply not an option for us to sneak any sub-par or sketchy materials into our products. Not everyone knows how deep our integrity runs and might assume this kind of info is true. It is absolutely not. We have proof that the post is malicious. Upon further investigation of “Extract Ninja’s” posts, we found an extremely conflicting statement, proving that the story is a lie. These conflicting statements combined with the fact that the users account was just created on the 26th of January point all fingers to this being a fake post used to be malicious towards us. If the bottle was in fact sealed when it arrived to the lab, then it likely was tainted and re-sealed for submission. Viscosity’s blend is a trade secret and is not required to be disclosed as it has been properly registered as such. We are an FDA liscensed facility, all of our products, labels, and facilities have been inspected and passed with flying colors by all of the necessary governing bodies. We appreciate everyone who is looking out for the industry, together we make it better, and together we can uncover malicious posts used to tarnish good reputations. We have worked incredibly hard to create a trusted brand and we will continue to stand by our integrity 100%. i thought this sounded much like the competition as well! Glad your out to set the record straight. I fully back the quality and honesty of True Terpenes. If I thought for a second they would lie about the viscosity and put mineral oil in there I’d be putting them on blast. These guys seriously do care about their customers and the quality of product they ship. I’ve known Ben, the owner, since before TT started, and he’s one of the best people I’ve met in the industry. We hear nothing but great things about this company! True Terpenes has been holding it down for quite some time now and has earned a great reputation in the industry. I am skeptical about these allegations! Hello! It’s great to have you and your company participating on these boards. I wanted to share an issue that I’m having and propose a possible solution. I’m in charge of manufacturing for a multi-state licensed medical cannabis co. I would love to use your “Viscosity” product in my vaporizer product line. Unfortunately, my team and I are unwilling to use any ingredient that does not list its constituent parts. This is for patient safety reasons as well as regulatory requirements. I understand that your company has developed this product and wants to guard its IP. One way we have dealt with similar issues in the past is to have an ingredient list to the effect of “this product contains some or all of the following.” If you could provide a similar list that would appease our regulators, allow our medical team to assess patient safety, and still provide a level of IP protection for your product. As well as your product is selling, I know that you’re missing out on some big clients due to the inability to disclose an ingredient list. Thanks for listening! A MSDS is required to be available to consumers like yourself. As an extraction manager, I agree that this would be really helpful from a compliance standpoint. 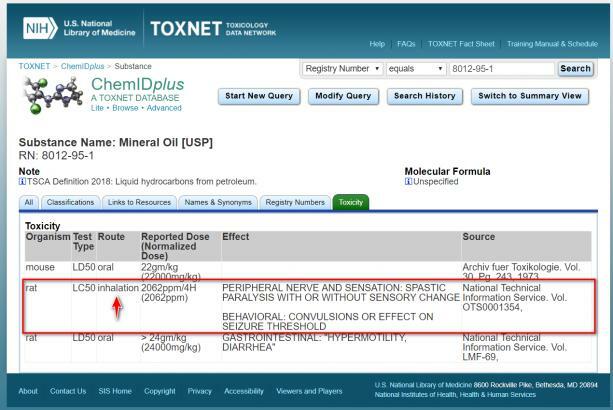 If there is any possible way that us extractors can connect TrueTerpenes with government regulators: for MA - CCC and the DPH then the actual manufacturers would not even need to see any ingredient list. I respect that a company would want to protect its IP, but a group like the government (which has no reason to go into terpene extraction/formulations) should be able to review the substances, say yes or no, and then redact anything that would be considered IP. A yearly review with these substances that have IP constituents (if the blend changed) would probably make all these stricter states feel much more comfortable. Of course there is also the issue that even government servers and data are not fully secure, but that is another subject entirely. it looks like they are still going on hot and heavy on ICmag. I agree, not looking good at all. Sure looks like Viscosity is just mineral oil. I read the whole thread and TT comes off as less than honest and forthright. IMO this a deal breaker if true. @Future I think you should make TT prove it’s not what the thread says it is. And if it is what the thread say it is, TT should be banned from this site for lying and ripping people off, as well as poisoning them. Otherwise you are supporting the poisoning of your users by supporting TT. Please, read that whole thread if you haven’t. It’s VERY damming. Three lab tests all found mineral oil and no terps! The lab found NO TERPS (yet again, for a 3rd time), but did find mineral oil and some heavy non-volatile substance (yet again, for a 3rd time). I am sending a 4th sample to a 4th lab next week. The 4th lab is ready and willing, and is allowing me to post the final report they product. There comes a time when facts and evidence become so overwhelming that arguments against realty need to stop. How many more labs do I have to send new samples of Viscosity to before the truth is accepted? Five? Six? Seven? To the naysayers: do the testing yourself or keep your opinion to yourself. Ran the sample and took a look. No terpenes whatsoever. We want to do additional tests and look further into this before we release results. What I can say is that their claims do not appear to be correct online. Will get back to you probably next week depending on how the additional tests go. My gut is that you may be right, that there may be mineral oil in there. – No Squalene was found. YUP! Pretty much confirmed it today. We ran a sample of mineral oil from the store against it, and the same kind of large hump appeared. I looks like it is just mineral oil, no terpenes or anything else. Maybe something added to make a lower viscosity that is nonvolitile. Unlike the label claim, this product contains 0 Terpenes or other volitile compounds. When compared to food grade mineral oil the chromatographs match, because of this we believe this sample appears to be mineral oil. We are currently investigating this issue. You can see how there are many possibilities due to all of the variables in this matter. This could be a ploy to get our secret recipe, this could be competition, this could be lab reports that went awry, etc. If extract ninja is actually working to share truth and has the best interest of the community in mind, we ask that they send proof of purchase and the name of the other lab they didnt want to “out” directly to outreach@trueterpenes.com to allow us to investigate this matter to the fullest. No identifying information will be shared publically. We cannot be sure about how this report came to be and are digging deeper to get some concrete answers. We appreciate your patience and all who have advocated for our integrity. We will get to the bottom of this. Thank you. It’s been more than 30 days. What did you find out? Wait, don’t waste you time because I already got to the bottom of it! You sell mineral oil as terpene diluent. Period. See my 3rd test. The lab went so far as to go to a store and buy USP grade mineral oil to test it to see if it matches Viscosity…it does! The three different labs all finding that Viscisoty contains mineral oil isn’t due to contamination because zero terpenes were found as well. So, unless contamination means removing all terps and replacing them with mineral oil, I don’t think so. 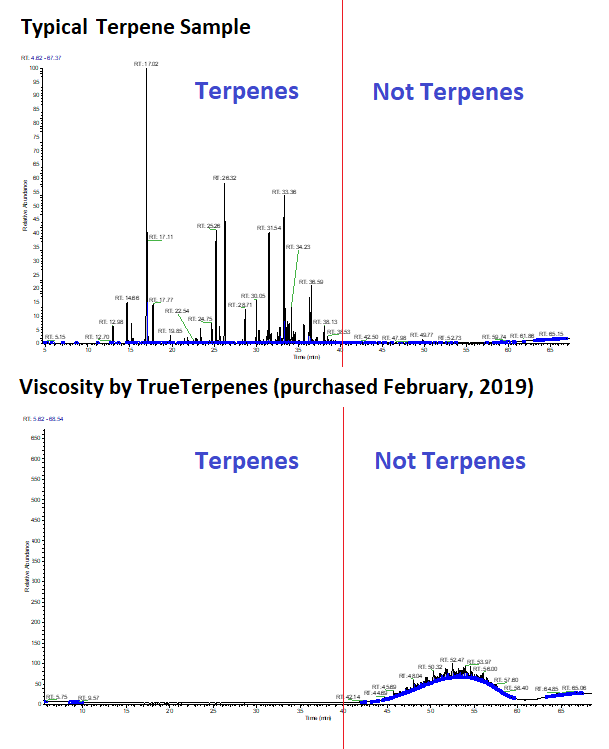 I think the truth is as clear as the nose on our faces: TrueTerpenes says Viscosity is all terpenes, but there’s really no terpernes at all, it’s nearly all mineral oil. Also, I find it very telling that TT hasn’t posted any updates on their “investigation” into the findings of mineral oil and no terps. They seem to be hoping we have a short memory and we will just keep buying their poison (that’s what it is, vaping mineral oil is poison). TT doesn’t care about you and I considering they are selling us mineral oil and calling it terps. As I posted before, mineral oil is toxic when vaped. TT is hurting people and they know it but they don’t care! They care about getting rich! A gallon of food grade UPS mineral oil costs $21.99. A gallon of Viscosity costs $6,000. That’s a 27,185.13% mark up at for selling people poison!